"I curse you with my name - you will be Blacula, a vampire like myself. A living fiend." Dracula cursed African Prince, Mamuwalde (WILLIAM MARSHALL) in 1815 when the Black Prince and his wife, Luva, (VONETTA McGEE) dared to entreat him to sign a petition abolishing slavery. 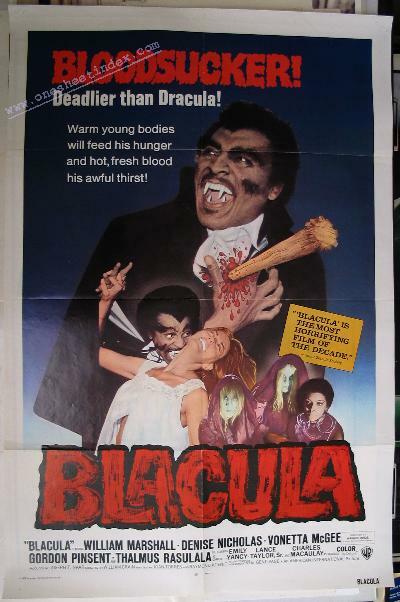 Blacula was sealed in a coffin doomed to be torn by an unquenchable lust for blood. Billy (RICK METZLER) and Bobby (TED HARRIS), two gay, young, decorators, know they'll make a fortune with all the antiques they've bought from Castle Dracula, especially the ornate coffins. But, the two unwittingly release Blacula and become his first victims - slaves to his will. Tina (VONETTA McGEE) and her sister Michelle (DENISE NICHOLAS) have brought Dr. Gordon Thomas (THALMUS RASULALA), Michelle's boss and fiancee, who is a police pathologist, to the funeral home to see their friend Bobby's body. the mortician, tells him there is no blood in the body. Chasing Tina, who looks exactly like his Luva, Blacula is hit by a taxi. His fury is uncontrollable and Juanita Jones (KETTY LESTER), the cab driver is soon another slave-victim. Gordon is stunned when a routine examination of Juanita's body reveals the same strange wounds. Homicide detective Jack Peters (GORDON PINSENT) has no leads on the killings, but promises to check the reports. Tina, Gordon and Michelle are at the Ethiopia Club celebrating Michelle's birthday when Blacula appears and Tina feels an overpowering attraction. He apologizes for frightening her and introduces himself as Mamuwalde, but leaves quickly, furious, when the club photographer, Nancy, (EMILY YANCY), takes his picture with Tina. Blacula soon has another victim. Tortured by his desire for Tina, Blacula goes to her apartment telling her his horrible story and begging her to join him as a vampire. Gordon and Michelle are attacked by Billy's body after digging up the grave looking for evidence. Realizing that Juanita must also be a vampire, Gordon takes Peters to the morgue to prove his story. When they arrive Sam (ELISHA COOK, JR.), the attendant, can't be found but suddenly Juanita attacks. Gordon thrusts a cross in her face, forcing he to a window where the early morning rays kill her. Peters is now totally convinced that vampires really are loose in the city. When Gordon discovers Mamuwalde is the vampire, he realizes that Tina is in grave danger. Gordon and Peters find the resting place of the vampires and destroy them by setting fire to the building. But, Blacula is still loose. Using his telepathic powers he guides Tina to a huge underground complex. Michelle, Gordon and the police are not far behind and spread out to find the couple. Blacula and Tina make a desperate attempt to escape through the maze of passages. One of the police fires at Blacula but Tina falls to the ground. Knowing that she is dying. Blacula clutches her from death by making her a vampire. Gordon and Peters find Blacula's coffin and quickly open the lid plunging a stake into the sleeping body. They discover too late that it is Tina they have destroyed, not Blacula. His love lost again, Blacula takes no more revenge. Without Tina he knows he cannot endure the life he has been cursed to live. He walks quietly up the stairs and into the deadly rays of the rising sun. When Gordon and the others arrive all they find is a cape covering a rotting skeleton. Swenson .......................... LANCE TAYLOR, SR. Songs: .......................... "WHAT THE WORLD KNOWS", "THERE HE IS AGAIN", "I'M GONNA GET YOU"